David and Jacqui Morris' documentary is an utterly compelling and deceptively simple exploration of the life and work of the famous British war photographer, Don McCullin. It takes the form of a candid interview with McCullin as he takes us through is career and shows us photographs, supplemented with occasional contemporaneous TV interviews with the photographer, and interviews with his editors. McCullin grew up poor in North London and by complete chance managed to a photograph printed that resulted in a seemingly endless stream of work. A combination of innate talent, ambition and self-confessed addiction to conflict took him to Vietnam, the Biafran war, the Middle East, Cyprus and Northern Ireland. And even when at home, McCullin took pictures of the East End poor and North London gangs. 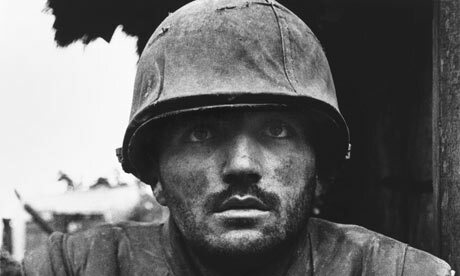 His pictures are still powerful - often extreme close-ups, beautifully framed - an unflinching document of inhumanity and conflict with flashes of individual dignity for us to cling to. And he speaks with candour and self-examination about the dangers of voyeurism, the nightmares, the despair about whether he did any good. Looking at the photos today, it's a reminder of a golden age of photojournalism, when newspapers would fund such expeditions and had the independence and the courage to print the results. For McCullin that golden age came to an end when Murdoch bought The Times and the government realised how provocative his photographs were. He wasn't allowed to cover the Falklands War and even if he had, Murdoch wouldn't have printed the results. This gives an air of melancholy to the film - a vanished time of real journalism, rather than today's banal embedded propaganda. McCULLIN is on release in the UK. McCULLIN has a running time of 95 minutes and is rated 15 in the UK.